As a company we try to stay out of politics. Having said that there is an issue that is near and dear to our hearts. It is drawing support from press and also bipartisan support from our representatives on all sides. That issue is “Made in America.” So we went all in! And here is what happened. 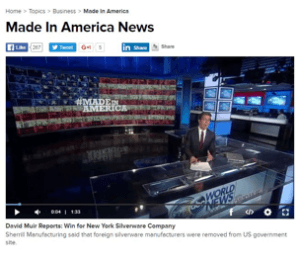 It all started a few years ago with David Muir and his “Made in America” segment on ABC World News Tonight. David and his staff have followed the storyline started by Diane Sawyer by featuring companies that are still making things right here in the USA. 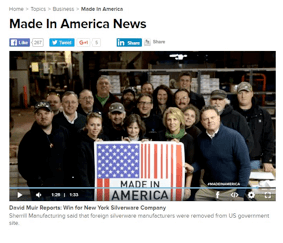 The first, one of three times we were featured on the segment, was as a result of our fight against companies making false “Made in USA” claims on the U.S. government procurement website known as GSA Advantage. 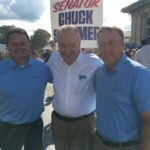 Senator Chuck Schumer (D) New York and his staff pitched in immediately to help us get the false claims removed from the site. 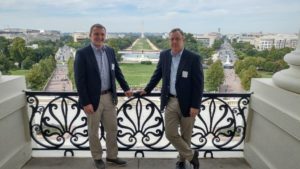 This lead to a great working relationship with the Senator and his staff on this and other issues affecting our company and our ability to keep it Made in America. The reason we are so interested in cleaning up the GSA website is that we enjoy a contract to supply the U.S. military with flatware. Under the rules of the Berry Amendment and other Buy America Act legislation, our military is supposed to purchase “trade act compliant” goods and services. In recent years loopholes have weakened rules and enforcement of the law has been virtually nonexistent. This is where Representative Claudia Tenney (R) New York and her staff stepped in. In July of this year she introduced the (SPOONSS ACT) as part of the DOD appropriations bill. The legislation was designed to restore longstanding language to the Berry Amendment to reestablish stainless steel flatware as a requirement, thus closing a 2006 loophole. The amendment was not included in this year’s bill. This was mainly due to opposition from the Heritage Foundation, a globalist-minded lobbying group that came out in opposition at the last minute threatening to blacklist any representative that voted for the measure. Claudia has plans to re-introduce the legislation this year and we will be prepared for the Heritage Foundation’s questionable tactics during Round Two. Senator Schumer has offered his support as well on the Senate side. The measure would likely lead to a tripling of our government contract business and the hiring of 10 or more production employees right here in Sherrill, New York. During the same timeframe this summer we received a call from the White House. To be honest, at first we thought it was a prank, but after the second call we realized that we had just been invited to the White House as part of the President’s “Made in America” week of events. 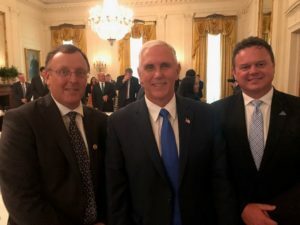 The meeting was a roundtable format also attended by Vice President Pence, The Secretary of Commerce and several other administration officials. Rep. Tenney joined us for the event where we were afforded an opportunity to introduce ourselves, our company and give a brief description of our Made in America Story. After explaining that we are the ONLY flatware manufactures left in the United States the President responded by saying “that is one hell of a statement.” It was a light-hearted event, let’s face it everyone in the room was there for one unified reason – to support American manufacturing. One of the antidotal highlights of the meeting was the handshake, pictured to the left. We were told that the President would enter the room, sit down, and then say a few words. Instead he entered the room, looked around and proceeded to walk directly up to me and shake my hand. It was a truly amazing day. Shortly after our trip to the White House we attended another roundtable event, this time organized by Representative Claudia Tenney at the Revere Copper facilities in Rome, N.Y. There were a dozen manufacturing companies represented at the event which provided us with an opportunity to address our challenges we face in today’s marketplace. Believe it or not the main topic was the inability to find qualified workers to fill positions that we collectively have open in our manufacturing facilities. We all left the meeting confident that our voice had registered loud and clear with Congresswoman Tenney and that she would take our concerns back to Washington as part of her legislative agenda. Next up was a series of meetings in conjunction with an organization we belong to called the Coalition for a Prosperous America. This bipartisan organization promotes the implementation of policies designed to fix our trade imbalance and broken trade policies. 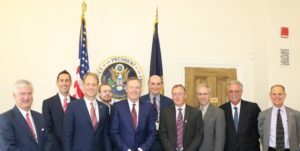 We met with Senator Schumer’s staff, Congresswoman Tenney and then the USTR Robert Lighthizer. The purpose of the meetings was to discuss trade policy, tax policy and currency policy, their impact on our ability to compete in a world where “free trade” policy has failed us. 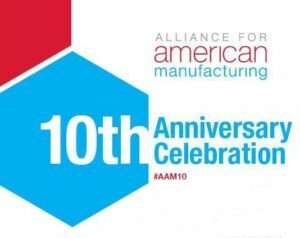 In November we were invited to attend the ten-year anniversary celebration of the Alliance for American Manufacturing. AAM is a non-partisan group supporting American Manufacturing with a strong emphasis on the steel industry. The event included a presentation by Leo Gerard, President of the United Steel Workers, and a series of interviews hosted by CNN Chief Political Correspondent Dana Bash. After the presentations participants were invited to a reception where we were afforded the opportunity to meet various elected officials and network with other American manufacturing companies. 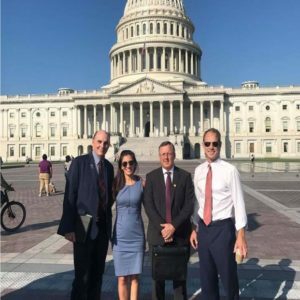 Now that we have established a presence in D.C. our goals in 2018 will include: getting our flatware into the White House; pushing forward with legislation to get flatware restored into the Berry Amendment; working with our friends at CPA and the Alliance for American Manufacturing to further the cause of promoting sound trade practices; and, forming or participating in other groups that will help us promote domestic manufacturing as the top priority agenda item it should be. We look forward to the continued support of Representative Tenney and Senator Schumer as well as those we have met in the Executive branch that support and promote rational trade policies and legislation. In an event-filled year we discovered that American manufacturing has many friends and many enemies in Washington. Made in America is not a partisan political issue, rather it is something that enjoys broad support from the American people as well as support from many Republicans and Democrats in all branches of government. Unfortunately there are still many in Washington, perhaps even still a majority, which still believe that “free trade” really exists. Michael Stumo of CPA would refer to them as “globalist zombies” because they have been pushing free trade rhetoric for so many decades that they seem incapable of recognizing that the United States is the only country that does not have a national trade strategy to protect its economic sovereignty. Restoring our middle class by re-establishing a strong manufacturing base in the United States is crucial to both our economic future and our national security. In 2018 we will be working with and supporting those in D.C. that are helping us to further the cause. We will also be working on spreading the word that blind faith globalism has failed the American people and we need a new strategy moving forward. One thing I can tell you after spending some time in Washington, your representatives do listen to their constituents so please, if you agree that American manufacturing and trade issues are important, let your voice be heard, loudly and often! Thank you so much for your efforts at promoting Made in the USA!!! I personally buy American made products Every chance I get! Sometimes it proves difficult if not impossible with some goods which leaves me and, I’m sure others very disheartened and, down right angry and, frustrated! God bless America!